Beauty Blog by Angela Woodward: Is Equate and other off brands just as good as name brands? Is Equate and other off brands just as good as name brands? In a word no. This question is a little tricky because some items are fine. For example I use equate toothpaste, go ahead and use equate tampons if you'd like, but I never trust equate when it comes to makeup and skin care. Why? Because the quality isn't the same. 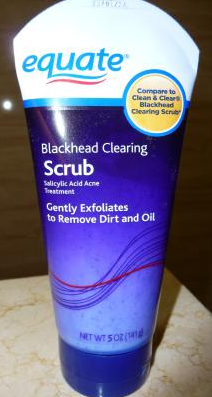 For example if you take Equate's Blackhead Clearing Scrub which is supposed to rival Clean&Clear's Blackhead Eraser Scrub and look on the back, the ingredients list is almost identical. But here is the problem, ingredients are listed in order starting by the items that make up highest content of the product. So if your cereal's first ingredient is sugar, then it has more sugar in it than anything else. The problem with this is if the first three ingredients on two bottles of product are listed as water, polyethylene and salicylic acid that doesn't mean they are the same. One product could have %40 water, %20 polythene and %10 salicylic acid while the second product could have %40 water, %39 Polythene and %2 salicylic acid. Just because you read them the same doesn't make them the same amount of effective. You have no idea what concentration of ingredients are in what products, all you know is the order. My advice? Stick with brand you can trust.